Just as with everything else it touches, the internet and the influence of those who create it are commoditising, granularising and generally bending out of shape the future of the modern workplace. Knowledge and the ability to create and shape it is the new currency of competition. In this, we see opportunities to create new forms and more hospitable workplaces better suited to boosting the knowledge-creating potentials of the minds they contain. We can see the roles enterprising upstart property players can take in changing the world of work and dislodging the influence of incumbents. In facing the change that is already perceptible through our own research, we are mindful of the words of Bill Gates, loosely paraphrased, that while we may overestimate the impact of technologies in the short term, we are definitely likely to underestimate them in the long term. The combination of our research and the distinctive Japanese design and culture of our design leader, Hiromi Lauren, ensures we see things differently. 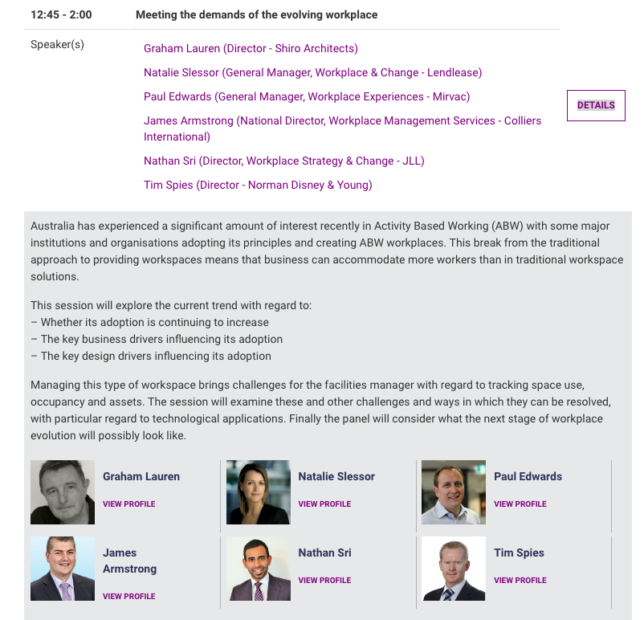 One result of the extensive research I’ve conducted into workplace strategy was that having published The Evolution of Workplace Strategy into a discipline of FM in the December 2016 print issue of Facility Management magazine, I was then invited in March 2017 to chair an expert panel on the subject of the evolving workplace at the Total Facilities Conference at Sydney’s Darling Harbour. What Is Workplace Strategy, And Why Is It So Important? I’ve also since been commissioned by another company to write its white paper on coworking, made all the more fascinating for its form’s emerging importance in the discipline of workplace strategy. There is surely plenty more to follow. It it is of interest to you, you can find more of our work at http://medium.com/workplace-strategy. As we move into the age of mobile computing and agile or activity based working, workspaces are already receding as physical manifestations of the organisation chart. In a knowledge age, the digitised workplace is the productivity machine of the modern economy. The great workplace property challenge is to construct great workplaces better suited to the shifting future of work. It’s in our blood to want to create the increasingly hospitable knowledge factories we believe are its future. In this new world, the auguries for developers and owners of commercial property stock resistant to change aren’t promising. They must adapt to the painful emerging reality that future businesses will want to take less, and different kinds of space. Small really is now better. Right now, as this realisation dawns, we are at the beginning of the evolution of the burgeoning professional discipline of workplace strategy. Its insights and disciplines are about to become embedded in the minds of business strategists at the tops of their organisations. In this age, as knowledge is now the main currency of competition, the absolute focus for developers and owners of commercial workplaces should be on producing property assets that more effectively facilitate knowledge-creation for their occupants. They may perceive these as being the spaces in which architects may be most interested. Paradoxically, as arresting as this might be for its advanced technological form, we think the most startling and influential innovation for the future of work may be its most disruptive and actually exist at the other end of the market. This is the workplace form found serving the needs of the smallest and startup businesses. It is the troublesome interloper of the digital age. Driven by the unbundling tendencies of the internet and by the influence of teams of software developers, the most influential form of future workplace may actually not be the grand monolithic corporate statement. In the emerging mix of workplace strategy, almost no property is any longer inert, but is a dynamic contributor to the delivery of business strategy. The emerging future of the workplace is far more importantly framed as a response to business strategy, creating the property vehicle through which to pursue an organisation’s higher goals. We argue our case here, in What is workplace strategy, and why is it important to the future of every business? In our estimation, the business models of CBD property owners and developers will be challenged as never before by the shrinking workplace. There will be great rewards and branding benefits for those who realise the opportunity to institute workplaces that make the individuals and organisations who occupy them smarter. A new form of intelligence can introduced into the workplace, built on the knowledge they already contain. Workplace management will establish a new professionalism, built on a system of qualifications created for workplace strategists, along with a rating system constructed to evaluate coworking spaces. Knowledge architecture will emerge as a discipline in its own right, meaning the ways of briefing to get those spaces right will adapt, using the collaborative tools that are already in use within the resident workplaces. What is workplace strategy, and why is it important to the future of every business? The new workplaces are knowledge laboratories, in which old work and its outputs are constantly being challenged in ways it is hard to predict, except for the fact that this is happening increasingly fast. For an emergent discipline with such obvious importance for the commercial property industry, Wikipedia remains strangely almost silent on the subject of workplace strategy. Those currently describing themselves as “workplace strategists” on the back of their success in managing a corporate relocation into “activity based working” (ABW) workspaces may concur with this definition. Yet workplace strategy’s new disciplines have far wider implications. They now direct not only the future of work itself across myriad workplaces, but also the fortunes of many currently powerful property owners, and the design of work itself. I was commissioned recently to write a white paper on coworking by another company, so, having spoken recently with both a handful of Sydney’s top coworking operators and residents, I am now more knowledgeable about coworking’s role in the development of workplace strategy. Coworking is workplace as a service, delivered as a service, and its potentials are exciting, not least because these spaces are the real knowledge factories of the future. Of course, I am not at liberty to use that other company’s content verbatim in our own promotion, but I have summarised some of my findings here, in this piece. I have concluded that for the moment, that although Sydney and Melbourne’s commercial property is experiencing unprecedented demand, there are reasons why coworking now presents the biggest contemporary challenge to the ageing business model of the established major property owners. So, how about this as an opportunity: the promise, if you are an operator of commercial workplaces, that your spaces can make the organisations that work in them smarter? The prospects (and learning) for the operator capable of making and justifying such an offer are surely enormous. Rewriting not just space requirements, but the necessary thinking and communications processes of businesses, is in turn creating an opening for a new workplace management discipline. It is one with perhaps profound implications for the property professionals of the future. It will be packaged and taught, probably simply as “workplace strategy,” and threatens ultimately to evolve into a truly data-backed, sensor-driven workplace science. And in its unfolding, even ABW may now be history, a passing fad, because what is coming, with its ever tighter focus on knowledge-creating workspaces, is by orders of magnitude more challenging, especially for those major commercial property owners. Paradoxically for them, helping workplace strategy’s practitioners get better at what they do presents a real opportunity for those owners. I am not so sure most have seen this yet. In the knowledge age, the workplace environment must above all be shaped most appropriately around both the knowledge it contains and which it must create, and the design of the work that must be performed to achieve this. This is no longer a property problem because when, through the incursions of new technologies and machine learning, workforces necessarily shrink, they no longer demand the workplaces we have been accustomed to. In the solution to this growing challenge, coworking plays a major role. I am playing a part in research aimed at establishing new standards defining the nature and quality of those coworking spaces. Its intention is to enhance, at first Sydney-wide, the prospects both for improved in-space collaboration, and to provide graded quality of occupancy reassurances for coworking’s residents and business owners. In a knowledge economy, most organisations are essentially concentrations of business model know-how driven by technology and key executional capabilities, themselves transformed by the constant acquisition, development and conversion of new knowledge into sales, and data. It is the “knowledge architectures” they comprise, each as unique to its individual owner as a fingerprint, that are the blueprints for creating smarter workplaces. But knowledge architectures are hard to visualise or to manage, or to provide services for, if you have no way of seeing, shaping or understanding them. Yet, the development of their customers’ knowledge architectures is also central to the most persistent existential threat to commercial landlords: the fast evolving discipline of workplace strategy. Whether you are an owner or an occupier, you need ways of getting a better return on your workspace. For owners, empty commercial space is simply painful and expensive. Worse, tenant companies getting smarter about workplace strategy tend to take less space, and that is a trend that is unlikely ever to reverse itself. For their part, tenants want to be able to fit premises better to meet the evolving needs of their businesses. To reconcile these opposing demands, we’ve spent time pondering how and if it is possible to deliver a better workplace briefing. In this, from the perspectives either of owners or tenants, the the use of social workplace technologies presents an unprecedented opportunity to get more effectively into the minds for whom you are designing. Based on our skills, previous work experience and expertise, we’ve made sure also to check and validate these suppositions with those with experience of large-scale workplace management and design. The unfolding of coworking and the evolution of workplace strategy as a workplace discipline will create the opportunity for an enterprising property developer-owner to create a new kind workplace. That is a journey we are keen to be part of, hence our continuing research and involvement in moving this discussion along. Improved workplace hospitality and an enhanced understanding of knowledge architecture can only enhance workplace productivity, and we aim to make this combination a key plank in our future development as a business.